Samsung Gear S3 was unveiled a week ago at the IFA 2016, European fair for consumer electronics held every year in Berlin. Certainly, the new Samsung smartwatch was considered among the most interesting things of the event, and in some ways, is perhaps one of the devices with highest symbolic value of all presented. In order to test it on your wrist (variant Gear S3 Classic or Gear S3 Frontier), you still have to wait two months until November 4. It has been the subsidiary of Samsung in the Netherlands that has been commissioned to confirm the release date of Gear S3 through its Twitter account, which speaks of the beginning of sales scheduled for Friday November 4th in Europe. Recall that Samsung Gear S2 models were put on sale on October 30, so the same pace for a few days is not maintained. This delay can be attributed to the withdrawal from the market of the new Samsung Galaxy Note 7 due to explosive batteries. Chances are that Samsung plan to sell its new smartwatch, along with its new flagship smartphone. As for prices, at the moment it would be estimated figures, about € 400, although it is possible that this figure may be higher depending on the countries where it is sold. Altimeter always active and therefore available to users who want to constantly monitor the altitude at which they are. The only necessary condition for this feature is that the device is connected to the Internet and the geo-locator is activated. Barometer to measure atmospheric pressure. It displays a warning as soon as there is pressure variations, as this usually indicates a rapid change in weather conditions. Tachometer able to report various statistics, such as average speed and total distance traveled. Even in this case, however, the Samsung Gear S3 GPS must be active to allow the tachometer process the data. Bluetooth and WiFi, speaker and microphone to handle calls, music and voice controls. Circular Super AMOLED 1.3-inch screen (360 x 360 pixels, 278 ppi), rotating bezel and Always On Display (AOD) to display the time at any time rather than automatically switch to black screen. The glass is a Corning Gorilla Glass SR+ and is certified IP68. Dual-core processor at 1.0 GHz. It only supports 3G and LTE connectivity for Frontier variant. 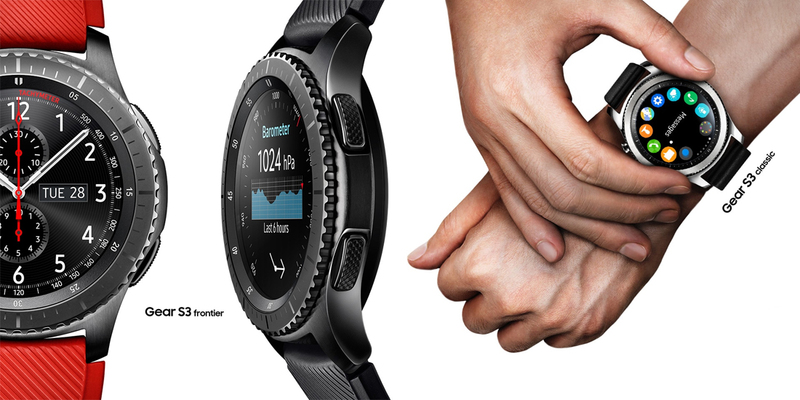 The Gear S3 measures 46 x 49 x 12.9 mm and weighing 57 to 62 grams, depending on the model, and is compatible with 22 mm straps.